Sharon Mills Draper is a professional educator and award winning writer. She was the 1997 National Teacher of the Year, a five-time winner of the Coretta Scott King Award, and is a New York Times bestselling author. Check out her website here. As we celebrate Martin Luther King, Jr. today, let's stop for a minute and applaud the valiant writers, like Sharon Draper, who write with honesty and authenticity for children and young adults. I had the amazing opportunity to speak with Draper while I was a graduate student at Clemson University. She was real, straightforward, and humble. That's what I've always seen in her writing. From Copper Sun to The Jericho Trilogy, Draper knows what young readers want, and she delivers on every level. 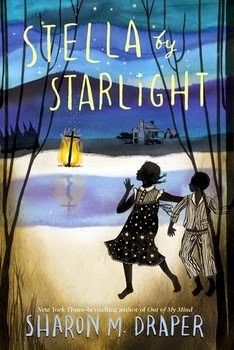 In Stella by Starlight, Draper puts us right in the middle of the action as 11-year-old Stella and her brother JoJo see the KKK gathering in the North Carolina woods at night. Burning a cross, Stella and JoJo quickly become fearful at the realization of what is happening and run to tell their parents. For the African American siblings, living in the South carries dangers on every corner. Walking down the street, as Stella recounts, is harrowing journey, one that once came with being slapped by a Caucasian man. Stella is intelligent and quick witted, though she struggles a little bit with getting her thoughts on paper. At the time when schools were segregated, Stella constantly questions her plight and wonders how different the white schools could be. She loves her classmates and her teacher, but the thought of always being inferior, or less valuable, hangs in the back of her mind. A trip to the candy store shows both compassion from the female, white store owner and inequality from the white kids who enter the store for candy. She simultaneously feels respected and disrespected in just a few moments. Draper paints both a hopeful portrait of Stella's warm heart and desire to be something more than label and a despairing picture of a town fearful of every move and whispered word. Age appropriate, Draper proves once again that she knows how to depict real situations with a finesse that comes only with experience, wisdom, and compassion. Stella by Starlight captures the spirit of a young girl struggling with her inner journalist and the forces that try to stop her.